Sf Hot Pass, under jockey Francisco Calderon, rolls to his fourth straight stakes win in Saturday's $25,000 B.F. Phillips, Jr. Stakes(G3) at Lone Star Park. GRAND PRAIRIE, TX—NOVEMBER 3, 2018—After a delay of nearly an hour while a line of thunderstorms rolled through the area, producing excessive cloud to ground lightning strikes and turning the track from fast to sloppy, they were finally off in the 21st edition of the Grade 3, $25,000 B. F. Phillips, Jr. Stakes. Sf Hot Pass, guided by Francisco Calderon, was first to the wire winning the 400-yard race, restricted to Texas-breds 3-yrs-old & up, in :19.343 seconds, a length in front of the rest, equaling a speed index was 107. Owned by Shannon Fisher of Midland, TX and trained by Leon Bard Sf Hot Pass earned his third stakes victory of the meet. The 5-yr-old gelding by Ivory James, won the Nevill Stakes, the Grade 1, Refrigerator Stakes and now adds the Phillips to his resume. He is the first horse to win all three during a single race season since the track opened in 1997. Sf Hot Pass went off as the favorite with mutuels returning $3.40, $2.20 and $2.10. The Golden Bowl placed returning $2.80 & $2.20. Dm La Jolla got the show and returned $3.40. Two-time winner of this race, Rc Me Leaving You finished fourth followed by Fast N Famous Eagle, Deala Quick Game, Fdp Rock Solid and Saved by Jesus Jm was last. The addition of the winner’s share of the purse upped Sf Hot Pass’ earnings to $110,530. This was his sixth win from 15 career starts and raised his perfect 2018 record to 4-for-4. P & J Racing and D. Stroebel bred Sf Hot Pass from the Mr Jess Perry mare Passem Up Perry. Graded stakes winner The Golden Bowl races for owner Rogelio Marquez, Jr. and trainer Fernando Lopez. Jockey Jesse Levario rode the son of Mr Eye Opener from the Dashing Bye mare First Dashin Nye. 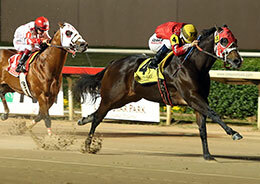 Bred by Jorge Meraz, The Golden Bowl earned $4,250 for finishing second, increasing his bankroll to $62,022. Jockey Rolando Cabrera rode third-place finisher Dm La Jolla for owner Sergio Jimenez and trainer Porfirio Fierro. Donna Mushinski bred the Hi Class La Jolla stakes winning gelding in Texas from the Prime Talent mare Dm Bella Mia. The $2,500 third-place payday moved Dm La Jolla's earnings to nearly $96,000. The Phillips Stakes win moved Bard within one win of the season leader, Josue Ponce, but Ponce won the nightcap, so Bard is again two back of Ponce. Their numbers going into the final weekend are 12 to 14 respectively. Neither Bard nor Ponce has won a training title here. It will be a first for either if they finish on top. The stakes victory also boosted jockey Francisco Calderon, who won a total of three races on the tonight’s card, within one of leading rider Jessie Levario, but yes, Levario was aboard the winner in the nightcap, so two wins separate them in the rider’s standings. Levario has 15 wins to Calderon’s 13. If Levario holds the lead it will be his first ever Lone Star Park riding title. If Calderon gets up it will be his second riding title at the Grand Prairie track. He won his first in 2016. Only two days of live racing remain in the 2018 Quarter Horse Season. Live racing will resume on Friday, November 9 and conclude with the featured Texas Classic Juvenile, Derby and Futurity on Saturday, November 10. 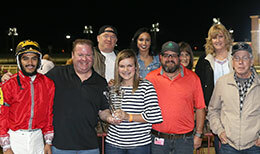 Gates open at 5 p.m. both nights for closing weekend and first race post time for each is 6:05 p.m.
Lone Star Park at Grand Prairie, a Class I racetrack operated by Texas Partners LSP and Global Gaming LSP. The track's 16-day 2018 Quarter Horse Season opens Friday, September 21, and concludes on Saturday, November 10. Live racing will be held two days a week, Friday and Saturday at 6:05 p.m. For more information on Lone Star Park visit LoneStarPark.com or follow us on Facebook and Twitter. Lone Star Park is also home to the multi-million dollar simulcast racebook, sports bar and event venue, Bar & Book. The 36,000 square foot venue is open to the public 363 days a year. Global Gaming Solutions, LLC (GGS), is a wholly owned subsidiary of the Chickasaw Nation with a primary business focus of pursuing entertainment, gaming and racing related opportunities in emerging jurisdictions in the United States and overseas as well as acquisition of regional gaming and entertainment assets. GGS LLC is the parent company of GG RP, which owns Remington Park in Oklahoma City, OK and GG LSP, which owns a significant stake in Lone Star Park. GG LSP is the track operator who owns the license to operate Lone Star Park and leases the property from the Grand Prairie Sports Facilities Development Corporation.